Private and public health insurance plans for freelancers in Germany. While your overseas travel insurance was sufficient until you reached Germany, a German health insurance is mandatory while in the country. Since 2009, it has been compulsory to take out health insurance if you are living and working in Germany. This rule applies to everyone, no matter whether you are a EU citizen or a national from a country which is subject to visa obligations. What if you work as a freelancer in Germany? By law, you still have to take out health insurance. • The third involves taking out insurance with an international company. If you have traveled to Germany from abroad, then, it is totally fine to use a health insurance policy from your home country. However, if you do choose this option, it is crucial to ensure that the foreign company you have taken out your insurance with meets the German government’s legal requirements. If you are a foreign national in Germany, German law states that you must either have German state or private health insurance. If the latter option applies to you, you must be able to provide evidence that your insurance meets the German government’s requirements. Broadly, they state that any non-state health insurance scheme must provide the same sort of coverage as state health insurance. for living in Germany, your age, or the activities you participate in. Moreover, the policy must function as a life insurance plan, i.e. it must run for an indefinite period of time, or be extendable automatically. Based in Bonn, the legal entity for regulating financial services is known as the Bundesanstalt für Finanzdienstleistungsaufsicht (Federal Supervisory Authority for Financial Services). It is responsible for the strict criteria that health insurance policies must meet, specifically with relation to Book V Section 257(2)(a) of the SGBV (the German Social Security Code). It is crucial to ascertain whether your international health insurance policy is valid in Germany. How do you do so? Simply ask your insurance company to give you the license number they have received from the BaFin. Another option is to ask your company to confirm that they have met the German statutory regulations. If they cannot provide a license or confirmation, it is likely that they do not meet the German criteria. 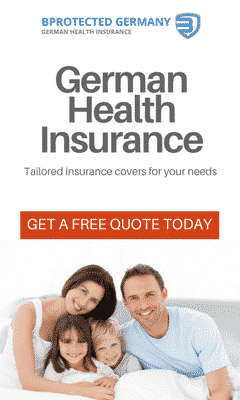 B-Protected Germany is a fully licensed, independent & experienced health insurance broker offering customer-friendly and personalized advice on every aspect of the German health coverage. They can help you find the option that best fits your budget and meets your needs.